Carmen was born in The Netherlands (Zwolle, 1972) and is based in Amsterdam. After her graduation as graphic designer at the Royal Academy of Art she worked for many years in design and advertising agencies. From an early age on Carmen was interested in Buddhism, and after she became a Buddhist practitioner, she met her thangka painter teacher, the well-known Andy Weber. Captivated by the rich tradition and detailed craftsmanship of these Tibetan Buddhist paintings she started with him her many years of training, thirteen in total. As is tradition within a thangka lineage, the teacher points out his successor(s), and in 2003 Andy told Carmen that it now was time for her to start teaching. It was something she never saw coming but took on with much love, passion and dedication. 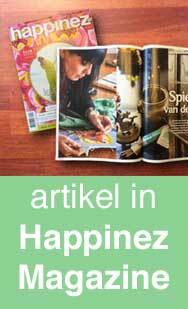 So in the beginning, when she was still working as a graphic designer, she started offering thangka classes in Amsterdam, which slowly expanded. 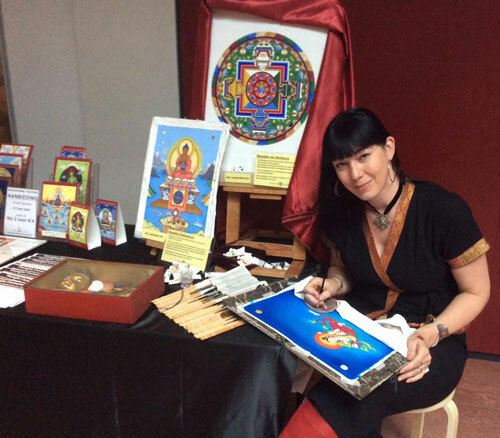 From 2008 on Carmen paints and teaches the art of thangka full time and travels around the world for it -her classes and lectures can be joined in Europe, the United States and in Asia, where she and offers them at universities, museums and Buddhist centers. An overview of venues can be found here. 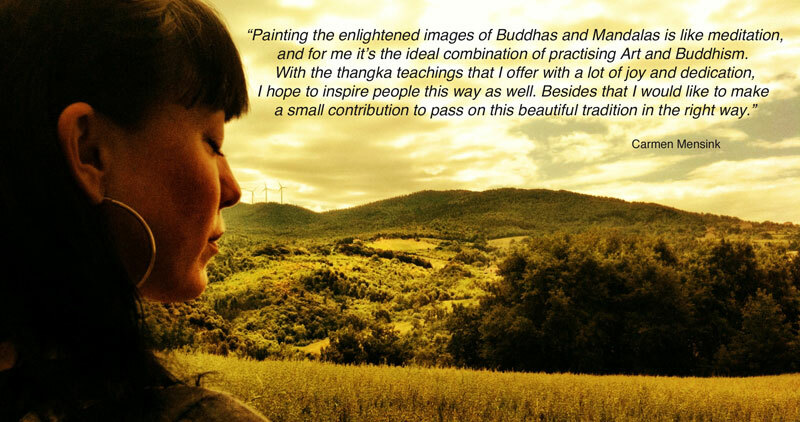 Carmen also offers private thangka teachings as well as thangka restoration services, and she can paint your Buddha statues according to tradition. Carmen can be contacted through the contact page.